-The 2016 Yoga in America Study Conducted by Yoga Journal and Yoga Alliance. Before I was a yoga instructor, I sold beer. (I know…it wasn’t the next logical career move) I loved working in the beer industry. I worked for craft breweries, distributors, and large breweries. I traveled all over the US, played golf at Pebble Beach, sat backstage at incredible concerts, and even raced a NASCAR. You may find my comparison of selling beer and teaching yoga a stretch, however the yoga industry isn’t much different. When I worked in the beer industry, I represented brands. Now, in my yoga career, I am a brand. Just like consumers are loyal to their beer brands, students are loyal to their yoga instructors. Whether you’re growing your student base or adding classes to your schedule, clear branding is critical for you to grow your career. Whether I was selling beer or teaching yoga, I asked my clients questions to learn how to work best together. Answering similar questions yourself will help you gain clarity on how your brand can be best utilized. Informing your students and potential employers with consistent brand messaging adds manpower to your sales force. Breweries look to gain shelf space for their brands, while yoga teachers look to hold space for their students. When I sold beer, I developed a sales and marketing toolbox that included all the programming, promotions and support our brands had to offer for that season. Since my toolbox worked in my previous career, I began to develop my sales and marketing yoga toolbox. Start by gathering all your information in one place for easy access and sharing. Your branding should be consistent across social media, blog, and your website. As you evolve as a yoga instructor, so does your yoga style. Refresh and update your information regularly. 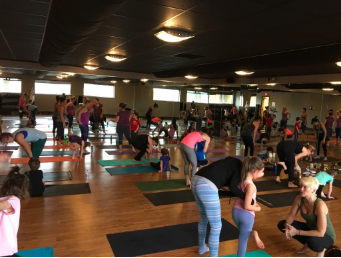 Once you have your yoga toolbox together, advertise your message and connect with your students. Beer brands advertise boldly, so shouldn’t you? Adrienne started practicing yoga when she was working in the corporate world. She traveled constantly and always looked for ways to keep healthy and active while on the road. After completing her RYT-200 Power Yoga Teacher Training she was hooked! She completed her RCYT-95 as well as her RYT-500 Advanced Yoga Teacher Training. A mother of two girls, Adrienne has dedicated her time to deepening her practice and connecting with her students (especially families & kids!) on ways to allow their yoga experience to ripple into all aspects of their lives. Throughout Adrienne’s trainings, her passion has led her to co-found FamilyFlow Yoga®️. FamilyFlow Yoga®️is one of four accredited schools in Illinois to offer a 95 Hour Registered Yoga Alliance Children’s Yoga Teacher Training program. Adrienne teaches in yoga studios, fitness clubs, boutique studios, as well as in school and after school yoga programs. FamilyFlow Yoga®️ has become an expert in offering continuing education programs and workshop for yoga instructors as well as schools’ staff and administrations. She’s committed to helping people reach their full potential both physically, mentally and emotionally. Meghan Markle Does Prenatal Yoga at 4:30 a.m.